Inbound from Watertown, Boston, MA, the Albatross has landed. 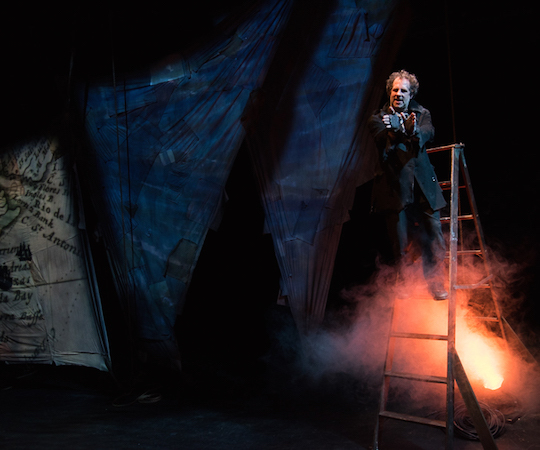 Samuel Coleridge’s fantastic and ghastly Rime of the Ancient Mariner is rewritten and adapted for the stage by the Poets’ Theatre. It’s an expansive work that barrels along with bits of Pirates of the Caribbean about its rigging but where it matters, down on its spar strewn deck of a stage, it’s sound and faithful enough. It owns, as does Coleridge’s greybeard, ‘strange power of speech’ and compelling presence. Despite water, water everywhere this is more wrap-around than immersive. You don’t sink into the Mariner’s story but Benjamin Evett, co-writer and solo performer, fastens it upon you and won’t let its folds drop until he’s done, which is how the poet would have it anyway. Evett’s acting is impressive, possessed by character, because there’s only penance left for an Irish American who knows he has ‘done a hellish thing’. He starts as a grouchy, foul-mouthed and dirty sailor and stays that way because he’s immortally cursed to tell his phenomenal tale. He holds his audience with his ‘glittering eye’ (and occasional insult) as he himself is held by his demons. We’re told for fancy’s sake that the old sailor met Coleridge once, in Bristol, and mocked his lilting verse. You’ll hear the ballad quatrain in Albatross but in only in key snatches. The narrative shape of the ‘Rime’ is still there but is considerably amplified, particularly in Part 1 where the dastardly Black Dog, privateer at large, shanghaies the Mariner, chases down a treasure galleon and chews off noses. The visuals, sound and SFXs that accompany this action are full on theatrical broadsides with the Mariner hauling ropes, hoisting sails and … corralling penguins. Nevertheless, Albatross would be serious about depicting a ‘soul in agony’, which is a must-have for any treatment of Coleridge’s poem. This is where Evett is most tested and where co-writer Matthew Spangler must have reached for words. I’m slightly surprised that they did not make more of the dice game between Death and Life-in-Death (a dead ringer for Lady Gaga?) and of its glaring image making. However, in our day and age the questions are as existential as they are Christian and it’s the philosophical open season when the Mariner snarls a reply as to ‘Why?’ Why, for Heaven’s sake, did he shoot the bird? Was it, God forbid, for fun? There is the prayerful close, which is good, but I was a little sorry to hear of a ‘zombie crew’ and not ‘this seraph band/Each one a lovely light’. No matter. If not for the Mariner, times are still a changing for the rest of us and this is a fullblown modern production in which caution is thrown to the to the wind. 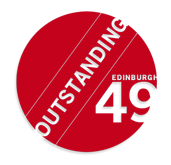 Visit the Edinburgh49’s Other archive.